The 2015 Vikings season is finally here! 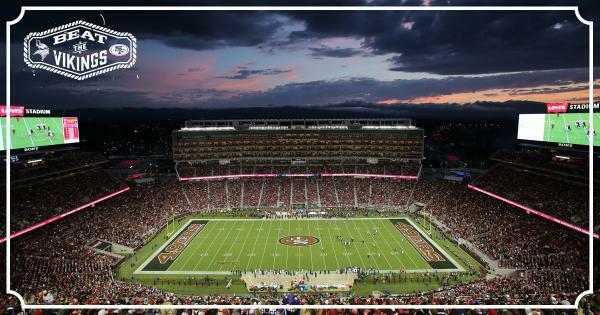 The Vikings open on the road against the 49ers, and we'll be there to cover it. Join in on the discussion as Andrew Krammer, Judd Zulgad and others react LIVE during the game with #1500ESPNLive. #1500ESPNLive is an experience like no other. You will get instant commentary, opinion, analysis and reaction to what is happening on the field. Enjoy real time videos, photos, audio and posts from around the world via social media. 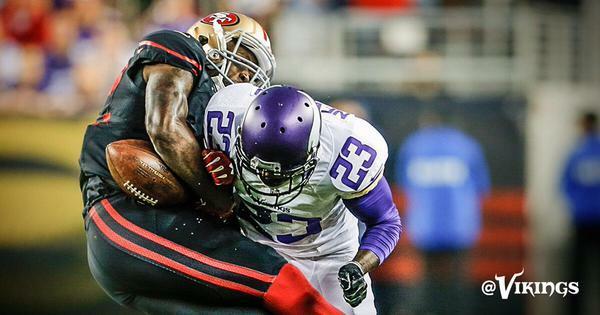 #49ers players getting all worked up about Harrison Smith laying the wood to Kaep. Totally legal. That's the risk when your QB runs. "This is why quarterbacks should NOT run. Those could be career enders." Why sign a kicker on the decline to an extension. At the end of last year, his stats were getting worse and it just continues. Jim Tomsula sweats a lot. Ed Biceps says Joseph never crossed into neutral zone, calls false start on 4th-and-1 against 49ers, who are now punting. 39-yard punt for @pinion92 . Vikings start on the 12 yd. line with 5:30 remaining in the 1st Q.
Reggie Bush surrounded by medical personnel. Jarryd Hayne makes his NFL debut ... and promptly butchers a punt, which #Vikings recover. Yamma-hamma. Surely AP should stay late after practice and learn how to pass block? Watching a first quarter like this, I can't help but think the NFL needs more preseason games.
.@Audiesel1 with the recovery on the fumble recovery!!! 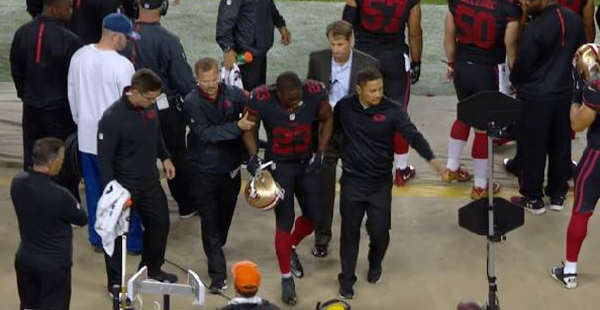 Injury update: @ReggieBush leg injury. Return is questionable. Reggie Bush questionable to return with a leg injury. Head down as he's carted off. #Vikings going for it on 4th-3 after Blair Walsh missed a 44-yard attempt. Each time Buxton hits a grounder in the infield, you jokingly say, 'He might beat that out,' assuming no chance. Seems like he usually does. How bad has it gotten for Blair Walsh? #Vikings pass on a 49-yard field goal to go for it on fourth-and-3. Not a good sign. "It's not been a pretty game for QBs. Neither guy looks sharp here early." Given Walsh's struggles, Zimmer had no choice but to go for it on fourth down in that situation. Is this a preseason game? Kaepernick doesn't step into any throws. Throws on tip toes. I'm not kidding when I say that Asiata might be giving Peterson tips for pass protection on the sideline.